Hair, feathers or scales cover the skin of most land animals. Despite their apparent diversity, these appendages share many features: they are mainly formed of the protein keratin, are produced by the topmost layer of the skin and they start to form with skin cells moving inwards to form a pit. Across species, the same genes are also involved in controlling the development of these structures. This suggests that they have all evolved from a shared ancestral appendage, which may have been fish scales. However, scales in fish are formed of bones, not keratin, and they come from a different skin layer. Here, Aman et al. explore the molecular mechanisms that control how zebrafish scales form and get their shape, which is a little-studied area of research. Cells at the surface of the fish were imaged live on the animal as they were developing and creating scales. The experiments involved manipulating the genetic information of these cells to tease out the molecular mechanisms that drive the creation of scales. This revealed that the genes that control the formation of the scales and of the appendages of land animals are the same and interact in similar ways. In particular, scales also require the skin to form a pit to develop, and the same genes direct this process in zebrafish and in furred or feathered creatures. The work by Aman et al. suggests that all skin appendages, regardless of being sported by fish, birds or mammals, descend from the same structure. It also puts forward the zebrafish and its scales as a good model for scientists to study so they can understand better how certain hair and teeth disorders arise in humans. Developmental patterning generates distinct gene expression regimes that regulate morphogenetic cell behaviors. Identifying core regulatory modules, elucidating the specific interactions they comprise, and how these activities are translated into discrete morphological outcomes are central goals of modern developmental biology. To these ends, considerable progress has been made at embryonic stages, yet patterning and morphogenesis at post-embryonic stages remain poorly understood. Skin appendages are classic developmental model systems that have been leveraged to generate insights into how mesenchymal–epithelial signaling interactions pattern tissues and affect morphogenesis (Lai and Chuong, 2016). These structures, including the hair, teeth, mammary and eccrine glands of mammals, feathers and scales of birds, and scales or scutes of reptiles are among the most conspicuous features of the adult form. In addition to being developmental biology models with clear biomedical relevance, skin appendages have been of longstanding interest for their evolutionary significance. Although amniote skin appendages such as hairs and feathers have widely varied morphologies, recent work suggests that all of these appendages derive from a common progenitor that was present in stem amniotes (Di-Poï and Milinkovitch, 2016; Wu et al., 2018). Another skin appendage is the scale of fishes. In many extant teleosts, scales comprise thin, overlapping plates of dentin-like calcified extracellular matrix embedded in the dermis (Sire et al., 2009). Similar to amniote skin appendages, fish scales develop relatively late in ontogeny and are distributed across the skin in a tight, hexagonal grid pattern in the adult. Scales have been the object of excellent histological and ultrastructural studies that have characterized developmental anatomy, and genetic analyses that have identified phenotypes associated with Ectosyslasin-A (Eda) and Fgf mutations (Harris et al., 2008; Rohner et al., 2009; Sire et al., 1997). Nevertheless, these serially reiterated, highly accessible organs have yet to be exploited as a model for understanding skin appendage development at a cellular level. There is also uncertainty as to whether fish scales and amniote skin appendages are homologous, that is, derived from a single archetype organ in a common ancestor (Paul, 1972; Sharpe, 2001). If all vertebrate skin appendages are homologous, we would expect that common developmental regulatory mechanisms underlie teleost scales, avian feathers, mammalian hair and other appendage types. Here, we use conditional-genetic manipulations, live imaging and gene expression assays optimized for post-embryonic fish to show that multiple signaling pathways, including Wnt/β-catenin, Eda, Fgf and Shh regulate scale patterning and morphogenesis. These analyses show that scale development relies on signaling interactions similar to interactions that regulate the patterning and morphogenesis of amniote skin appendages such as hair and feathers, and support a model in which diverse skin appendages of vertebrates arose from a common archetype. Additionally, we uncover a novel process of HH-dependent collective cell migration that is necessary for epidermal invagination during skin appendage morphogenesis. Together, our analyses establish the fundamental parameters that govern scale initiation and morphogenesis and lay the groundwork for exploiting zebrafish scale development as a system in which to discern general principles of developmental patterning, regulation of morphogenetic cell behaviors, and the evolution of genetic regulatory mechanisms. Histological, ultrastructural and fate mapping studies showed that scale morphogenesis begins with the formation of a bi-layered dermal papilla immediately beneath the epidermis (Mongera and Nüsslein-Volhard, 2013; Shimada et al., 2013; Sire et al., 1997). Yet these studies did not unambiguously identify the cell types involved. We hypothesized that, due to their calcified composition, scales will be formed by osteoblast-like cells. To test this, we analyzed the distribution of osteoblasts using fish transgenic for a previously described reporter with osteoblast-specific expression, sp7:EGFP (DeLaurier et al., 2010). sp7 (formerly osterix) encodes a zinc finger transcription factor that is necessary and sufficient for osteoblast differentiation from committed progenitors (Zhang, 2012). Simultaneously, we monitored the distribution of calcified extracellular matrix using Alizarin Red S (ARS) vital dye (Adkins, 1965; DeLaurier et al., 2010). Weak sp7:EGFP expression was first detected in clusters of cells in the skin, immediately followed by detection of calcified matrix (Figure 1A d1–d2 and Figure 1—figure supplement 1A and B). Throughout subsequent scale development, the distribution of calcified matrix correlated with the distribution of sp7:EGFP+ cells (Figure 1A, d2–d6; Figure 1—figure supplement 1B) suggesting that sp7:EGFP labeled the dermal cell population that deposits calcified extracellular matrix comprising the scale plate. Hereafter, we refer to this cell population as dermal Scale Forming Cells (dSFCs). Early sp7:EGFP+ dSFC clusters that lacked detectable calcified matrix showed a bi-layer papilla corresponding with structures described in histological and ultrastructural studies (Figure 1—figure supplement 1C). Therefore, sp7:EGFP labels developing scales from very early in morphogenesis and likely earlier than other scale osteoblast markers (Iwasaki et al., 2018). Following their initial appearance, scales grew centripetally from the scale focus with a posterior bias leading to polarized extension through the addition of dSFCs and calcified matrix (Figure 1—figure supplement 1D,E). In fully formed scales, sp7:EGFP+ dSFCs were arranged in a monolayer along the deep aspect of the calcified matrix but also looped around to cover the superficial surface, overlapping with the intensely ARS-labeled limiting layer (Figure 1A, Figure 1—figure supplement 1F–H). Skin appendage primordia in amniotes spread sequentially across the skin during development (Chuong et al., 2013; Dalle Nogare and Chitnis, 2017; Painter et al., 2012; Sick et al., 2006). In-toto repeated live imaging of individual zebrafish revealed similar sequential addition of scale primordia (Figure 1B–1F, Video 1). The first scales were found in a row on the caudal peduncle followed by a second row that formed on the flank above the ribs (Figure 1—figure supplement 2A,B). Within one day, two complete rows of scales formed (Figure 1B). Additional rows were added dorsally and ventrally, and columns were added anteriorly and posteriorly (Figure 1B–1D; Figure 1—figure supplement 2F–I). Finally, a third scale origin appeared just posterior to the mandible and spread along the ventral surface to meet the ventral row scales just posterior to the pectoral fin insertion (Figure 1E; Figure 1—figure supplement 2J). These events lead to a complete coat of scales arranged in a half-offset, hexagonal grid on the juvenile fish (Figure 1F). Under optimized conditions, this process took ~13 days (Figure 1—figure supplement 2C–E). Identical scale patterning can be visualized using sequential calcium vital dye labelling (Figure 1—figure supplement 2K–O). There are presently no staging conventions for squamation in zebrafish. Based on our live imaging, we propose a staging system for this process. Two rows (2R) represents the initial appearance of scales up to two complete scale rows. Four rows (4R) are fish with four complete scale rows, one dorsal and one ventral to the original two scale rows. This stage corresponds with the stage of grossly apparent posterior squamation (SP) defined in (Parichy et al., 2009). Finally, beard (B) stage fish have scales along the dorsal anterior, as well as the initiation of post-mandibular scales, corresponding with the anterior squamation (SA) stage defined in (Parichy et al., 2009). Our observations of scale development indicate that sequential addition of skin appendage primordia, leading to a tightly packed hexagonal grid, is a feature of epidermal appendage development common to both amniotes and anamniote fishes. In turn, this suggests the hypothesis that these diverse appendage types are patterned by common mechanisms. To evaluate this hypothesis we next tested requirements for specific signaling activities during scale development. If amniote skin appendages and teleost scales arose from a common ancestral organ, we predicted that Wnt/β-catenin signaling should be necessary for scale development as it is for ectodermal appendages of amniotes (Andl et al., 2002; Dhouailly et al., 2017). To inhibit Wnt/β-catenin signaling during scale development, we used the hs:dkk1 transgenic line that allows conditional expression of a potent and selective Wnt/β-catenin signaling inhibitor (Glinka et al., 1998; Stoick-Cooper et al., 2007). As predicted, inhibiting Wnt/β-catenin beginning prior to the appearance of sp7:EGFP+ papillae prevented scale formation (Figure 2A and C). This early treatment also blocked localized expression of the Wnt/β-catenin signaling activity reporter 7xTCF:mCherry (Figure 2B) (Moro et al., 2012). Beyond scale phenotypes, Wnt/β-catenin inhibition prevented fin outgrowth and formation of pelvic fin rays (Figure 2A and D), demonstrating a role for this pathway in fin development, in addition to previously documented functions in fin regeneration (Kawakami et al., 2006; Stoick-Cooper et al., 2007; Wehner et al., 2014). Scale and fin phenotypes were not caused by a generalized retardation of development, as Dkk1-overexpressing fish achieved sizes similar to those of non-transgenic, heat-shocked sibling controls (Figure 2E). If Wnt/β-catenin signaling is necessary for initiating scale development, signaling activity must precede overt scale morphogenesis. Live imaging of fish doubly transgenic for 7xTCF:mCherry and sp7:EGFP showed that, as predicted, Wnt/β-catenin signaling activity was evident before sp7:EGFP+ scale papilla had formed (Figure 2F). After papilla formation, Wnt/β-catenin signaling became polarized toward the posterior scale margin, where it remained throughout scale growth. Because scales develop in an invariant sequence we were also able to analyze expression of conserved Wnt/β-catenin targets lef1 and axin2 in fixed specimens (Cadigan and Waterman, 2012; Hovanes et al., 2001; Jho et al., 2002; Ramakrishnan and Cadigan, 2017). In agreement with the 7xTCF:mCherry reporter, lef1 and axin2, as well as nuclear localized β-catenin, were found in skin patches presaging the appearance of scales (Figure 2—figure supplement 1A,B, pre scale and papilla; Figure 2—figure supplement 1E,F). Expression subsequently became restricted to a posteriorly biased ring around the circumference of the developing scale (Figure 2—figure supplement 1A,B, extension; Figure 2—figure supplement 1E,G,H). Although expression dynamics of these Wnt/β-catenin activity markers were broadly similar, axin2 was expressed exclusively in dermal cells and was absent from the epidermis, whereas lef1 was expressed in both dermis and epidermis (Figure 2—figure supplement 1A,B). As expected for Wnt target genes, early Dkk1 induction prevented patterned expression lef1 and axin2 (Figure 2—figure supplement 1C,D, early hs:dkk1). However, Dkk1-mediated Wnt repression initiated after scales had formed attenuated expression of axin2, but not lef1 (Figure 2—figure supplement 1C,D, late hs:dkk1), suggesting a mechanism independent of Wnt/β-catenin signaling for maintaining lef1 expression during scale outgrowth. Taken together, expression of Wnt/β-catenin target genes prior to papilla appearance and lack of scales in Dkk1 overexpressing fish demonstrates that Wnt/β-catenin signaling is necessary for initiation of scale development. We next sought to address how Wnt/β-catenin signaling interacts with other signaling pathways during scale development. The phenotypes of fish inhibited for Wnt/β-catenin signaling—abrogated scale and fin formation —were similar to phenotypes of fish lacking Ectodysplasin-A (Eda) signaling (Harris et al., 2008; Kondo et al., 2001). We therefore hypothesized that Wnt/β-catenin and Eda signaling interact during scale development. To elucidate regulatory linkages between these pathways we used the zebrafish nkt mutant line, harboring a presumptive eda loss of function allele (Harris et al., 2008). nkt mutants lacked overt indications of scale morphogenesis and sp7:EGFP+ dSFCs in the skin, in addition to having impaired fin outgrowth (Figure 3—figure supplement 1A). Yet, live imaging of sp7:EGFP; 7xTCF:mCherry transgene expression and in situ hybridization against lef1 showed that Wnt/β-catenin activity was patterned into spots in the epidermis of scale-less nkt mutants (Figure 3A–3D). Wnt/β-catenin targets were initially expressed in scale-appropriate patterns in nkt mutants, yet further rows were not formed and expression domains did not polarize. These findings indicate that initiation and patterning of Wnt activity in the skin is Eda-independent, whereas later refinement and reiteration of Wnt activity requires Eda signaling. The absence of overt scale development despite initiation of Wnt signaling, also demonstrates that Wnt signaling alone is not sufficient to induce scales in the absence of Eda. Conversely, we asked whether Eda signaling requires Wnt/β-catenin activity. We first examined the expression of genes encoding Eda and its receptor Edar during normal scale development. Immediately prior to scale formation, eda expression disappeared from epidermal cells above forming scale papillae where edar expression was first detected (Figure 3—figure supplement 1B,C pre-scale). Subsequently, eda was expressed broadly in dSFCs whereas edar expression became localized principally to the posterior margin of the scale epidermis (Figure 3—figure supplement 1B,C papilla, extension) in the vicinity of Wnt/β-catenin target genes (Figure 2F and Figure 2—figure supplement 1). These similar expression patterns (and common phenotypes of pathway blockade) suggested the hypothesis that edar is a Wnt/β-catenin signaling target during scale formation, whereas eda expression might be independent of Wnt/β-catenin. We therefore induced hs:dkk1 following the appearance of initial scales (2R stage) and assayed expression of eda and edar. As predicted, edar expression was strongly attenuated in Dkk1-overexpressing, Wnt/β-catenin inhibited fish, whereas eda expression persisted (Figure 3E,F). Lack of edar expression in Wnt/β-catenin inhibited fish, taken together with residual Wnt activity in nkt mutants that nevertheless formed no scales, suggested that a lack of Eda pathway signaling is the primary reason that scales do not develop in Wnt inhibited fish. To test this, we conditionally misexpressed Eda and Edar while manipulating Wnt/β-catenin signaling. In fish with normal Wnt/β-catenin signaling, misexpression of either Eda or Edar initiated scale development, as revealed by accumulations of sp7:EGFP+ dSFCs in regions where scales do not normally form at these stages (Figure 3G,H, control). Misexpression of Eda in either epidermis or dermis initiated ectopic scale development (Figure 3—figure supplement 2A,B), whereas Edar did so only when misexpressed in the epidermis (Figure 3—figure supplement 2C,D), suggesting that competence to respond to Eda signaling is unique to epidermis. However, Eda/Edar driven ectopic scale induction was completely blocked in the absence of Wnt/β-catenin signaling (Figure 3G–3H, hs:dkk1). Therefore, neither Wnt/β-catenin nor Eda signaling is sufficient to trigger scale development in the absence of the other. 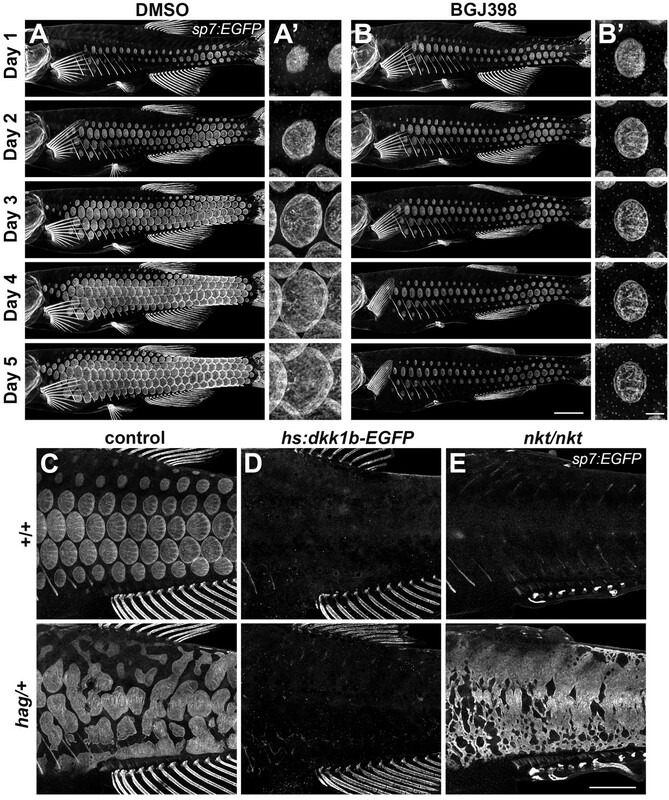 Fgf signaling has been implicated in skin appendage development of amniotes (Huh et al., 2013; Mandler and Neubüser, 2004; Petiot et al., 2003) and in scale development of teleosts: zebrafish harboring mutations simultaneously in fgfr1a and fgf20a have scales that are smaller than normal, whereas fish mutant for fgfr1a alone have scales that are larger than normal. It remains unclear whether Fgf signaling is required for scale initiation, outgrowth or both (Daane et al., 2016; Rohner et al., 2009). To circumvent potential functional redundancies and to test the necessity of Fgf signaling for scale development, we employed the pan-Fgf receptor inhibitor BGJ398 that has been shown to specifically block activity of Fgf receptor kinase but not other closely related kinases (Guagnano et al., 2011). This treatment led to an immediate and complete arrest of squamation and scale growth without affecting overall somatic growth of the fish (Figure 4A,B; Figure 4—figure supplement 1A–C), demonstrating that Fgf signaling is necessary for both scale initiation and outgrowth. To determine which Fgf receptors are involved in scale development, we generated cDNA from 4R stage skin and assayed by RT-PCR the expression of each of the five Fgf receptor genes present in the zebrafish genome. Of these, amplicons for fgfr1a, fgfr1b and fgfr2 were recovered. While riboprobes against fgfr1b did not yield tissue specific staining, consistent with previous reports (Rohner et al., 2009), fgfr1a was detected in dSFCs and fgfr2 in the epidermal posterior margin during scale development (Figure 4—figure supplement 1D,F). To determine how Fgf signaling integrates with Wnt and Eda signaling during scale development, we used hagoromo (hag) mutants that overexpress Fgf8a in the skin post-embryonically due to a viral insertion upstream of fgf8a (Amsterdam et al., 2009; Kawakami et al., 2000). We found that hag/+ fish develop large, disorganized sheets of sp7:EGFP+ dSFCs (Figure 4C), a previously overlooked phenotype. In hag/+ fish with repressed Wnt/β-catenin signaling, neither sheets nor foci of sp7:EGFP+ dSFCs developed in response to fgf8a overexpression (Figure 4D). 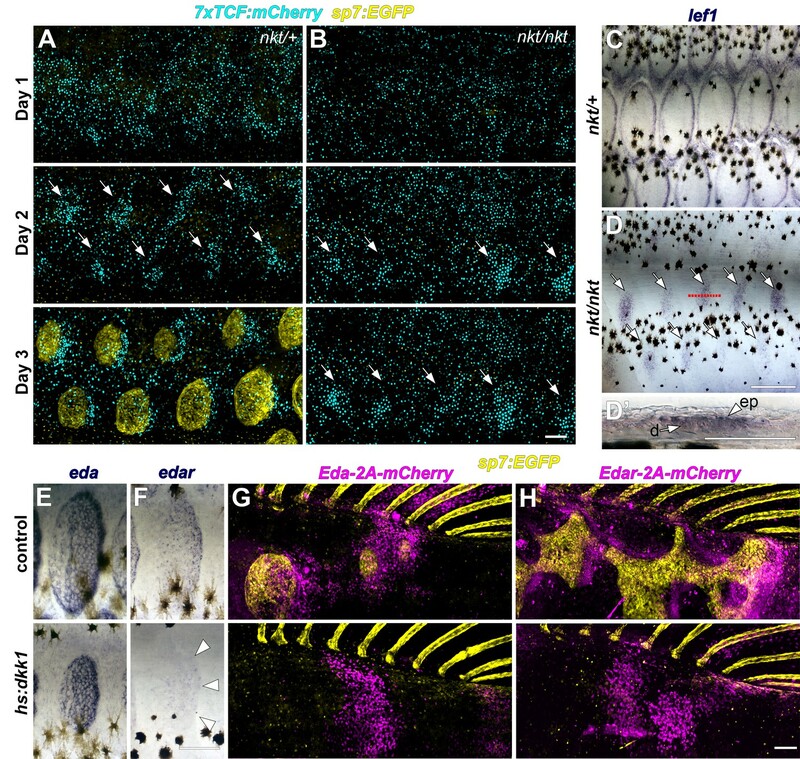 By contrast, hag/+ fish simultaneously homozygous for nkt—and so lacking Eda but retaining residual Wnt signaling activity (Figure 3A–3D)—formed broad sheets of sp7:EGFP+ dSFCs (Figure 4F). Taken together these results show that Fgf-mediated differentiation of dSFCs requires Wnt/β-catenin, but not Eda signaling. The Wnt-dependence of Fgf signaling is not likely due to modulation of Fgfr gene expression (Figure 4—figure supplement 1E,G) but could reflect direct or indirect regulation of other Fgf pathway components yet to be identified. HH signaling is necessary for morphogenesis of amniote skin appendages (Bitgood and McMahon, 1995; Dassule and McMahon, 1998; St-Jacques et al., 1998), and shha transcript has been detected in developing zebrafish scales (Harris et al., 2008; Iwasaki et al., 2018; Sire and Akimenko, 2004). To elucidate the role of HH signaling, we used a heat-shock inducible dominant repressor form of Gli2 (DR-Gli2) and treatment with the Smo antagonist cyclopamine (Gould and Missailidis, 2011; Shen et al., 2013). These treatments did not affect induction or patterning of scales, but did alter scale morphogenesis. In normal scale development, the epidermis folds around the growing posterior margin of the developing scale (Figure 5A). Strikingly, epidermal folding was completely blocked by HH repression (Figure 5B). Correspondence of DR-Gli2 and cyclopamine phenotypes (Figure 5—figure supplement 1A) and repression of HH pathway targets (Figure 5—figure supplement 1B) confirmed specificity and efficacy. These results also demonstrated that epidermal morphogenesis during scale development is an active, HH-dependent process and not simply a passive consequence of scale plate growth, indeed, epidermal folding was completely absent even when underlying scale plates overlapped (Figure 5—figure supplement 1A). We next investigated the expression dynamics of HH ligand-encoding shha, the conserved HH transcriptional target hhip, and a transgenic reporter of HH signaling, gli2-D:mCherry (Chuang and McMahon, 1999; Lum and Beachy, 2004; Schwend et al., 2010). Since HH repression did not interfere with scale induction we predicted that expression of HH pathway genes and signaling activation would appear later in scale morphogenesis. We found that—unlike Wnt/β-catenin, Eda and Fgf signaling—HH signaling began only after papilla morphogenesis (Figure 5C). shha was initially expressed in the epidermis overlying the scale papilla and was later restricted to a column of two to three cells at the posterior scale margin (Figure 5—figure supplement 1D). gli2-D:mcherry and hhip were detected in a population of cells beneath the sp7:EGFP+ dSFCs, where expression persisted throughout scale morphogenesis (Figure 5C; Figure 5—figure supplement 1E). 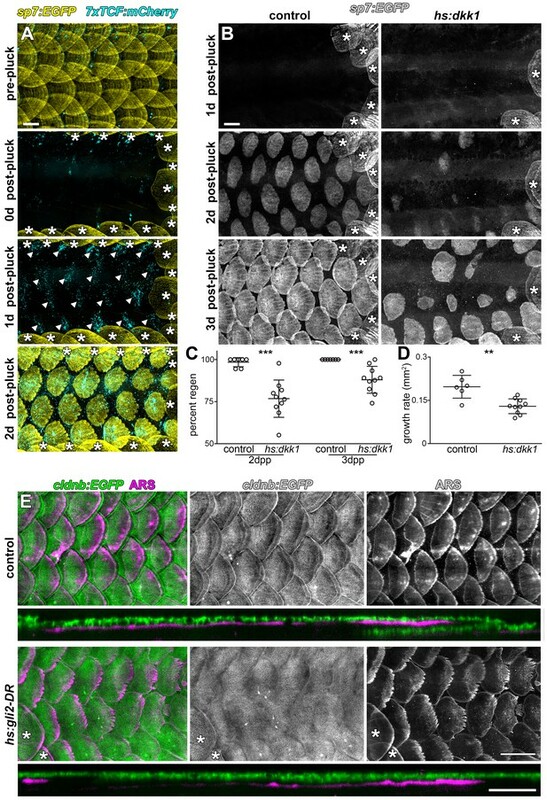 To further investigate the requirement for HH signaling in epidermal morphogenesis, we imaged fish doubly transgenic for the epidermal transgene cldnb:EGFP and gli2-D:mCherry throughout scale development. This revealed cldnb:EGFP+ epidermal cells invaginating into the underlying dermis in close association with the HH-responding population (Figure 5D). Live imaging of cells at the leading edge of invaginating epidermis revealed hallmarks of active invasive migration including broad lamellipodia and long cellular extensions (Figure 5E). If HH signaling triggers epidermal invagination by promoting invasion, we reasoned that Shha overexpression might promote excessive or ectopic invagination (Shen et al., 2013). 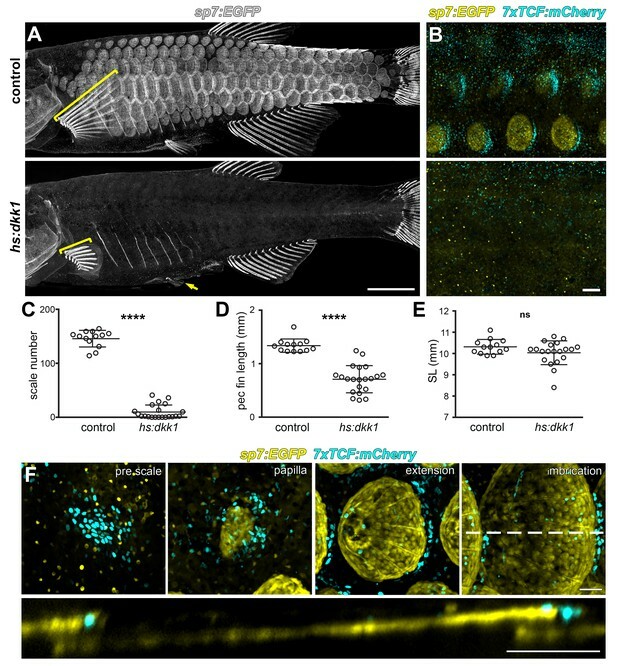 Unfortunately, Shha overexpression in fish transgenic for hs:shha-GFP led to rapid kyphosis, failure to feed and developmental arrest, precluding analyses of scale morphogenesis (Figure 5F). Strikingly, however, epidermal cells of these fish rapidly moved from the surface of the fish to the glass coverslip (Figure 5G). Cells at the leading edge of this sheet were cldnb:EGFP+ and displayed numerous long filopodia, consistent with active migration. Similar phenotypes have been observed in early larval skin and are associated with impaired epidermal cohesion and increased invasiveness (Boggetti et al., 2012; Carney et al., 2007). Because expression of shha in the epidermal posterior margin overlaps with expression of Wnt/β-catenin target genes and with edar (Figure 2F, Figure 2—figure supplement 1A,B,E–H; Figure 3—figure supplement 1C), we hypothesized that shha expression might require Wnt/β-catenin signaling, Eda signaling, or both. We therefore assayed expression of HH signaling components while manipulating Wnt/β-catenin and Eda pathways. shha, hhip and gli-D:mCherry expression were strongly attenuated in both Wnt-repressed and nkt mutant fish (Figure 5—figure supplement 1F–H). 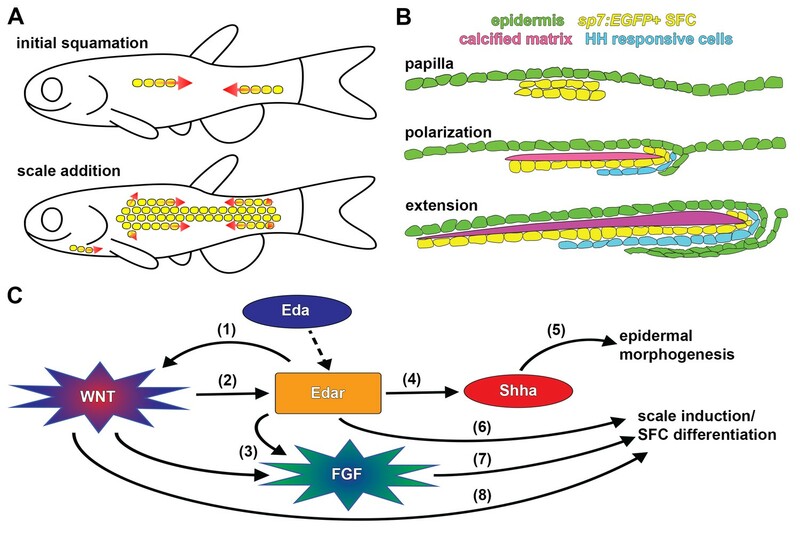 Since nkt mutants retain epidermal Wnt signaling activity (Figure 3B) but lack Eda, these data suggest that shha expression is regulated by Eda signaling during scale development. During normal life, fish often lose scales owing to interactions with other species and the environment, and scales have long been recognized for their regenerative ability (Smith, 1931). 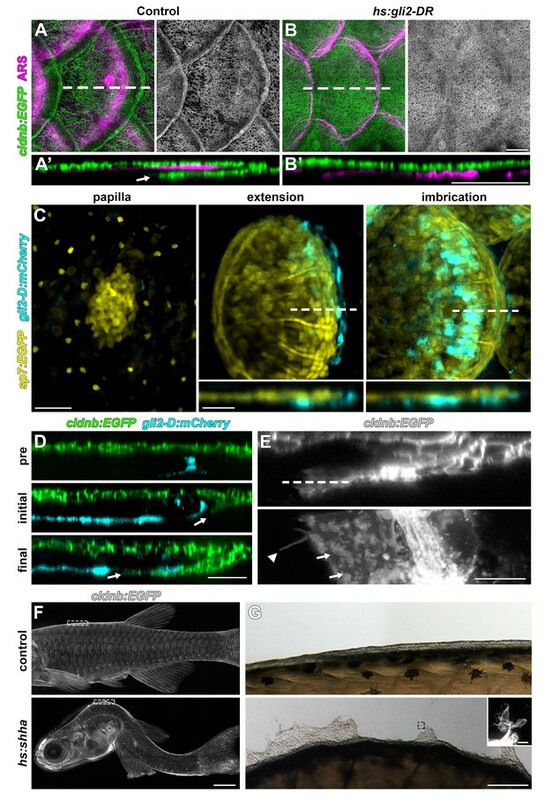 To further test roles for early (Wnt/β-catenin) and late (HH) signaling pathways, and whether functions are conserved in both ontogenetic and regenerative contexts, we removed all scales from the caudal peduncle of adult transgenic fish. One day after scale removal, patterned 7xTCF:mCherry expression revealed Wnt/β-catenin signaling in the epidermis, presaging the appearance of regenerated scales (Figure 6A). To test the requirement for this activity, we repressed Wnt/β-catenin signaling during scale regeneration by Dkk1 induction. This resulted in the regeneration of significantly fewer, slower growing scales as compared to controls (Figure 6B–6D). Finally, to test the role of HH signaling during regeneration we expressed DR-Gli2 following scale removal. As during scale ontogeny, HH-repression completely blocked epidermal morphogenesis (Figure 6E). Therefore, Wnt/β-catenin and HH signaling play similar roles during scale development and regeneration. Our analysis, based on live imaging of individual fish, has revealed the developmental anatomy of squamation and individual scale development. We find that zebrafish squamation proceeds through an invariant sequence of row and column addition (Figure 7A), this differs from previous reports based on fixed specimens that inferred a sequential spread of scales from posterior to anterior (Sire et al., 1997). The sequence we documented resembles that of goldfish (Carassius auratus) and medaka (Oryzias latipes)(Iwamatsu, 2014; Li et al., 2015). Since the lineages leading to zebrafish and medaka are thought to have diverged over 300 million years ago (Near et al., 2012), the squamation sequence presented here potentially represents a conserved, ancestral character of teleosts. Zebrafish squamation is also strikingly reminiscent of the ordered addition of chicken feather and reptile scale anlagen, suggesting this mode of patterning is conserved throughout vertebrates (Di-Poï and Milinkovitch, 2016; Jung et al., 1998). Previous histological and ultrastructural studies have characterized the basic anatomy of scale development (Lippitsch, 1990; Sire et al., 1997; Sire and Akimenko, 2004). We infer that sp7:EGFP+ osteoblast like cells (dSFCs) deposit the calcified scale plate. Based on the morphology and distribution of these cells, they likely correspond to dermal cells identified in previous fate-mapping (Lee et al., 2013; Mongera and Nüsslein-Volhard, 2013; Shimada et al., 2013). Our analyses of dSFC distribution in live animals showed that these cells first appear as a bi-layered condensation, corresponding to the dermal papilla identified in histological analyses (Sire et al., 1997). Since dermal papilla formation represents the very first overt indication of scale morphogenesis, sp7:EGFP proved to be a useful marker for scale initiation. By labelling epidermis and using vital dyes that reveal calcified matrix, we were able to monitor key cell populations involved in scale formation. Combining these assays with visualization of signaling pathway activity revealed the distribution of signaling event during scale morphogenesis. For example, we find that a sheet of HH-responding cells develop beneath nascent scales and presumably coordinate scale extension (Iwasaki et al., 2018) with epidermal invagination (Figure 7B), through intermediary mechanisms that are currently not known. Forward genetic screens have implicated Eda and Fgf signaling in scale development (Harris et al., 2008; Kondo et al., 2001; Rohner et al., 2009). The discovery that Eda signaling is necessary for development of both amniote skin appendages and fish scales suggested a single origin of skin appendages in ancient fishes (Di-Poï and Milinkovitch, 2016; Harris et al., 2008; Houghton et al., 2005; Kondo et al., 2001; Zhang et al., 2009). Yet, it remains debated whether involvement of Eda signaling implies homology between amniote and fish skin appendages or rather a general functional requirement of Eda for epithelial–mesenchymal signaling interactions (Sharpe, 2001). We found that Eda and Wnt/β-catenin signaling integrate similarly during fish scale and amniote skin appendage development: (i) Wnt/β-catenin signaling was initiated in the absence of Eda signaling yet pattern refinement and reiteration were Eda-dependent (Figure 3A–D); and (ii) Wnt/β-catenin signaling was necessary for the expression of the Eda receptor, edar (Figure 3F; Houghton et al., 2005; Zhang et al., 2009). Simultaneous manipulation of multiple signaling activities revealed that while Eda and Fgf signaling are sufficient to drive ectopic differentiation of dSFCs and scale development, these pathways were able to do so only in the presence of functional Wnt/β-catenin signaling. Since dSFCs do not differentiate in Wnt-inhibited fish with simultaneous upregulation of Eda or Fgf, there are likely other, as yet unidentified, parallel mechanisms by which Wnt regulates scale development (Figure 7C). These interactions are again similar to signaling interactions previously described for hair and feather patterning in amniotes (Andl et al., 2002; Houghton et al., 2005; Huh et al., 2013; Liu et al., 2008; Mandler and Neubüser, 2004; Petiot et al., 2003; Sick et al., 2006). During late steps in scale development, we found that Wnt/β-catenin–﻿Eda dependent HH signaling regulates epidermal morphogenesis. Since HH signaling is also necessary for epidermal morphogenesis during hair and feather development (McKinnell et al., 2004; St-Jacques et al., 1998), it is possible that some functional outputs of skin appendage signaling networks are conserved and anciently evolved. In turn, this suggests a previously unappreciated role for invasive migration in epidermal morphogenesis that may be of general relevance to understanding cellular mechanisms underlying skin appendage development and regeneration (Armstrong et al., 2017). It will be interesting to learn how modifications to these terminal processes have contributed to diversity in skin appendage morphologies across vertebrates. Taken together, our analyses of teleost scale developmental genetics using zebrafish are consistent with a single origin of skin patterning mechanisms in ancient fishes that has been conserved in extant vertebrates, even as the final adult morphology of feathers, hairs and scales appear wildly divergent. Importantly, the fossil record indicates that early tetrapods were endowed with fish-like calcified dermal scales (Coates, 1996; Jarvik, 1996), with a progressive loss of calcified matrix over geological time (Mondéjar-Fernández et al., 2014). In light of conserved developmental regulatory architecture, this suggests a scenario in which skin appendages lost dermal calcified matrix and gained epidermal keratinization ultimately leading to the skin appendages of extant amniotes. Conservation of molecular mechanisms that regulate skin appendage patterning and early morphogenesis enables the use of zebrafish scale development as a model system for understanding vertebrate skin patterning and morphogenesis with exceptional opportunities for live imaging and forward genetic analysis, complementing existing chicken and mouse models. Fish were maintained in the WT(ABb) background at 28.5°C. Lines used were Tg(sp7:EGFP)b1212 abbreviated sp7:EGFP (DeLaurier et al., 2010); Tg(hsp70l:dkk1b-GFP)w32T abbreviated hs:dkk1(Stoick-Cooper et al., 2007); Tg(7xTCF-Xla.Siam:nlsmCherry)ia5 abbreviated 7xTCF:mcherry (Moro et al., 2012). Tg(Mmu.Foxa2-cryaa:mCherry)nu15Tg abbreviated gli2-D:mCherry (Schwend et al., 2010); Tg(hsp70l:gli2aDR-EGFP)umz33Tg abbreviated hs:gli2-DR (Shen et al., 2013); Tg(hsp70l:shha-EGFP)umz30Tg abbreviated hs:shha (Shen et al., 2013); Tg(−8.0cldnb:LY-EGFP)zf106Tg abbreviated cldnb:EGFP (Haas and Gilmour, 2006); nacktdt1261 abbreviated nkt (Harris et al., 2008); hagoromo abbreviated hag (Kawakami et al., 2000). For regeneration experiments, scales were removed using forceps. All coding sequences and in-situ probe templates were amplified using Primestar-GXL (Takara) from cDNA prepared with SSIII (ThermoFisher) and cloned into pJet1.2/blunt (ThermoFisher) with the following primers: lef1 5’tgtagggtgaggaggactttca, 5’cctgtagctgctgtctttgctt; axin2 5’agggataatattaagcgtcagcag, 5’ggcccttttgaagaagtatctgta; eda 5’agaggacgaggaagttcggtat; 5’gtgcatgtgttcaggtttggta; edar 5’ttacggcactaaagacgatgatta; 5’ggattagtgcagttctgtgttcc; fgfr1a 5’tcagaaagtgctgatgtcctagtc, 5’cataagtctgcacacacacacact, fgfr2 5’aattcgctgtctgctctttttct, 5’gtctcagtgtttttgagaactgga; shha 5’acaacgagaaaccctgctagac; 5’gtctctctctcactctcgctctct; hhip 5’tcagcagtcctgtttatttctgag, 5’gtaacattgccaaatggtgaagag. hsp70l:eda-2A-nls-mCherry abbreviated Eda-2A-mCherry, and hsp70l:edar-2A-nls-mCherry abbreviated Eda-2A-mCherry, were made using the tol2 Gateway Kit (Kwan et al., 2007), and injected together with tol2 mRNA (Kawakami, 2004). In-situ probes and tissue were prepared as described previously (Quigley et al., 2004). Probes were hybridized for 24 hr at 66°C. Post-hybridization washes were performed using a BioLane HTI 16Vx (Intavis Bioanalytical Instruments), with the following parameters: 2x SSCT 3 × 5 min, 11 × 10 min at 66°C; 0.2x SSCT 10 × 10 min; blocking solution [5% normal goat serum (Invitrogen), 2 mg/mL BSA (RPI) in PBST] for 24 hr at 4°C; anti-Dig-AP, Fab fragments (1:5000 in blocking solution, Millipore-Sigma) for 24 hr at 4°C; PBST 59 × 20 min. AP staining was performed as described (Quigley et al., 2004). Tissue for sectioning was equilibrated into 5% gelatin (300-bloom, type-A, Sigma), post-fixed in 4% PFA/PBS overnight at 4°C and sectioned on a Vibratome 1500 (Harvard Apparatus). Tissue was fixed in freshly prepared 4% PFA/PBS (EMS) for 1 hr at 4°C, blocked using blocking solution (described above) for 24 hr at 4°C and incubated with rabbit anti-beta-catenin antibody (1:1000 in blocking solution, Sigma PLA0230) for 24 hr at 4°C. Secondary antibody (Alexa Fluor 568 Goat anti-rabbit; Life-Technologies ALL036) was applied at 1:400 in blocking solution. 3 µM DAPI and 130 nM Alexa Fluor-488 Phalloidin (ThermoFisher) were used as counterstains. 12 × 20 min PBST washes were performed following both primary and secondary antibodies. All heatshocks were performed in a 10 gallon glass aquarium equipped with a 1000 watt submersible heater and a programmable temperature controller (Process Technology). Larvae were given 6 × 1 hr 39°C heat shocks per day. Early hs:dkk1 and hs:gli2-DR: PR stage larvae (Parichy et al., 2009) were selected and heat-shocked for 10 d. Late hs:dkk1: 2R stage larvae (Figure 1B) were selected and heat-shocked for 3 d. hs:Eda-2A-mCherry and hs:Edar-2A-mCherry: PR stage larvae were selected and heat-shocked for 5 d. For scale regeneration, heatshock induction began 16 hr prior to scale removal and was maintained throughout regeneration timecourse. BGJ398: 2R stage larvae (Figure 1B) were selected and incubated daily in 1 µM BGJ398 (Selleckchem)(Guagnano et al., 2011) or 0.1% DMSO for 1 hr over 5 d. Cyclopamine: PR stage larvae were selected and incubated daily in 40 µM cyclopamine (Selleckchem [Gould and Missailidis, 2011]) or 0.25% ethanol for 2 hr over 12 d. All larvae were housed individually in 100 mL system water and fed freshly-hatched Artemia (Aquacave) between treatments. Vital dyes were dissolved in fish system water and titrated to pH 7.5 with sodium bicarbonate. Fish were incubated in 0.4% Alizarin Red-S (ARS) or 0.2% calcein (Sigma) for 1 hr at 28.5°C and washed for at least 1 hr in fresh system water. Live imaging: larvae were immobilized using 0.2% Tricane Methanesulfonate (Western Chemical) and imaged on an inverted Zeiss AxioObserver microscope equipped with Yokogawa CSU-X1M5000 laser spinning disk. In-situs: Zeiss AxioObserver or AxioZoom V16 uprigt stereomicroscope. Immunostainings: Zeiss LSM-800 scanning confocal microscope. Brightness and contrast were adjusted using Adobe Photoshop when necessary. Quantifications were made using ImageJ and analyzed using GraphPad Prism. All tests of statistical significance used two-tailed, unpaired t-tests with Welch's correction. Cold Spring Harbor Perspectives in Biology 4:a007906. Transactions of the Royal Society of Edinburgh: Earth Sciences 87:363–421. Molecular Biology and Evolution 33:162–173. Mini Reviews in Medicinal Chemistry 11:200–213. Journal of Medicinal Chemistry 54:7066–7083. Bulletin of the Aichi Univ. of Education. Methods in Cell Biology 77:201–222. Journal of Fish Biology 37:265–291. Journal of Vertebrate Paleontology 34:1454–1459. Fish scale development: hair today, teeth and scales yesterday? The International Journal of Developmental Biology 48:233–247. Beijing Da Xue Xue Bao. Yi Xue Ban = Journal of Peking University. Health Sciences 44:659–665. Thank you for submitting your article "Wnt/β-catenin regulates an ancient signaling network during zebrafish scale development" for consideration by eLife. Your article has been reviewed by three peer reviewers, one of whom is a member of our Board of Reviewing Editors and the evaluation has been overseen Didier Stainier as the Senior Editor. The reviewers have opted to remain anonymous. In this landmark study by Aman et al., the authors use the zebrafish to analyze the signaling requirements for scale development. They make good use of mutant and transgenic lines to both image and perturb this process. They reveal a surprising degree of evolutionary conservation in zebrafish scale development with that of other appendages such as chicken. These data are convincing, and also open up the zebrafish to further downstream studies using the system. Also, by providing a staging convention for squamation, similar to what they have done for pigment cells, this paper will be of general use to other investigators studying appendage patterning. Overall, this is a very well done study and we are happy to move forward with acceptance once a few textual edits are addressed. The main issue is that some of the evolutionary connections were thought to be too strongly worded, and it would be helpful if you could modify the tone to address the comments raised by reviewer #3 below. We are not requesting any additional experiments. 1) What is known about the relationship of the sp7 transcription factor and regulation of the downstream signaling nodes (i.e. Wnt, HH) they have identified. Is sp7 in the fish known to regulate or converge with these in turning on downstream genes? Are there likely other cell-type specific transcription factors that might act as master regulators? 2) Is there a relationship between scale emergence and any of the known pigment cells that are similarly emerging during this time point of development, and are these functionally connected to each other? The manuscript by Aman et al., addresses the mechanisms of formation of zebrafish scales. This represents an interesting system, as it provides a good model for studying the formation of a simple bone structure, as well as having the potential to reveal evolutionary insights by comparing the mechanisms of formation of scales across different species. This paper focuses on the signaling pathways that might control scale regeneration. Through the combination of imaging of transgenic lines and pharmacological and genetic perturbations, the authors demonstrate that osteoblasts follow a precise developmental program of differentiation to generate scales. This process is driven by the interplay of several signaling pathways. Wnt is the most upstream regulator, activating the Edar/Eda, Shh and Fgf pathways, which have different effects on scale induction. Overall, the experiments are well executed, and the results properly interpreted. I find the findings important and that they represent a significant extension over a similar recent paper by Iwasaki et al., 2018. For these reasons, I would recommend publication of the paper. This is a landmark paper on the development of zebrafish scales. The images are stunning and provide new insight into how the scales initiate and pattern in the adult fish. The authors use genetics and imaging to identify the key signaling pathways that regulate these processes. Overall, the work is very well done, and provides a new staging system for the scale developmental process. The work will be of interest to a broad audience, in part because of the imaging that captures these processes for the first time. 1) While the experimental work is well done, the interpretation within evolution is less convincing. They often frame their work within the context of addressing how amniote skin appendages and teleost scales arise from a common ancestral organ. While this is a very interesting idea, and there is evidence for this, it is not clear how this specific study contributes to this idea beyond what is already known. The authors need to explain this more clearly, or tone down their claims. "Our observations of scale development indicate that sequential addition of skin appendage primordia, leading to a tightly packed hexagonal grid, is a feature of epidermal appendage development common to both amniotes and anamniote fishes." "Taken together, our analyses of teleost scale developmental genetics using zebrafish suggest a single origin of skin patterning mechanisms in ancient fishes that has been conserved in extant vertebrates, even as the final adult morphology of feathers, hairs and scales appear wildly divergent." "These analyses produce clear evidence for a single, ancient origin of vertebrate skin appendages, reflected in common developmental genetics of widely divergent appendage types across phylogenetically disparate vertebrate lineages." These seem like overstatements, and it is not clear to me how the authors can state this based on their experiments. 2) The signaling pathways identified are common for many developmental processes, and it is their downstream targets and tissue specific control that will most likely determine how they contribute to scale formation. The conceptual conclusion from the work presented here also seems to step too far into the evolution model. For example: "Since HH signaling is also necessary for epidermal morphogenesis during hair and feather development (McKinnell et al., 2004; St. Jacques et al., 1998), the functional outputs of signaling on morphogenesis are also likely conserved and anciently evolved. In turn, this suggests a previously unappreciated role for invasive migration in epidermal morphogenesis that may be of general relevance to understanding cellular mechanisms underlying skin appendage development." These are rapid conceptual jumps based on the evidence presented here on pathways widely used in many developmental systems and would benefit from rephrasing. 3) The authors begin by following the transgenic expression of sp7:EGFP which is said to mark osteoblasts. The authors need to explain the sp7:EGFP transgenic line, and the specificity of the sp7 promoter. 4) Some of the text is subjective and should be toned down. For example, the word unprecedented in this sentence: "Our analysis, based on live imaging of individual fish, has revealed the developmental anatomy of squamation and individual scale development with unprecedented resolution. " Further, in the Introduction the justification that it is an understudied area is also distracting, such as the word "inattention": "This inattention perhaps reflects perceived technical challenges to working with larval fish, as compared to embryos." Here, and throughout, the text would make more of an impact to keep it based on the science. 5) Are the cldnb:EGFP+ epidermis in hs:shha truly migrating off the fish onto the glass cover slip? Perhaps they are sluffling off the fish and easily adhering to the glass? In mammals, sp7 regulates expression of secreted Wnt inhibitors Dkk1 and Sost (Zhang, 2012). There are almost certainly cell-type specific transcription factors that regulate scale development. Elucidating roles of feedback inhibitors and cell type specific transcription factors was, unfortunately, outside the scope of the current manuscript but is the subject of ongoing investigation in our lab. There does not appear to be a functional relationship between hypodermal pigment cells and scales. Scaleless nkt mutants, for example, produce normal stripes (Harris et al., 2008). Rather, it is likely that both pigmentation and scale development rely on common global regulators of developmental progression such as thyroid hormone. This is an area of ongoing investigation in our lab. […] 1) While the experimental work is well done, the interpretation within evolution is less convincing. They often frame their work within the context of addressing how amniote skin appendages and teleost scales arise from a common ancestral organ. While this is a very interesting idea, and there is evidence for this, it is not clear how this specific study contributes to this idea beyond what is already known. The authors need to explain this more clearly, or tone down their claims. This is not intended as an evolutionary hypothesis but a statement of empirical fact. Sequential addition of appendage primordia occurs in both fish and chickens (Chuong et al., 2013), and we have shown it to occur in zebrafish as well. “Taken together, our analyses of teleost scale developmental genetics using zebrafish are consistent with a single origin of skin patterning mechanisms in ancient fishes that has been conserved in extant vertebrates, even as the final adult morphology of feathers, hairs and scales appear wildly divergent.” (Discussion section). “These analyses show that scale development relies on signaling interactions similar to interactions that regulate the patterning and morphogenesis of amniote skin appendages such as hair and feathers and support a model in which diverse skin appendages of vertebrates arose from a common archetype.” (Introduction). Our inferences are based on the observations that (i) specific requirements for signaling activity are similar between fish scales and amniote skin appendages, and (ii) the connectivity of these pathways is also similar. Since signaling pathways can wire together differently in different developmental contexts (Aman and Piotrowski, 2008; Arkell and Tam, 2012; Armstrong and Bischoff, 2004; Genikhovich et al., 2015; Monuki, 2007; Piran et al., 2009), the most parsimonious explanation for common regulatory networks is common origin. Nevertheless, since it is impossible to rule out convergence of regulatory architecture, we have qualified our evolutionary interpretations of the experiments with the above edits. 2) The signaling pathways identified are common for many developmental processes, and it is their downstream targets and tissue specific control that will most likely determine how they contribute to scale formation. The conceptual conclusion from the work presented here also seems to step too far into the evolution model. For example: "Since HH signaling is also necessary for epidermal morphogenesis during hair and feather development (McKinnell et al., 2004; St-Jacques et al., 1998), the functional outputs of signaling on morphogenesis are also likely conserved and anciently evolved. In turn, this suggests a previously unappreciated role for invasive migration in epidermal morphogenesis that may be of general relevance to understanding cellular mechanisms underlying skin appendage development." These are rapid conceptual jumps based on the evidence presented here on pathways widely used in many developmental systems and would benefit from rephrasing. “During late steps in scale development, we found that Wnt/β-catenin-Eda dependent HH signaling regulates epidermal morphogenesis. Since HH signaling is also necessary for epidermal morphogenesis during hair and feather development (McKinnell et al., 2004; St-Jacques et al., 1998), it is possible that functional outputs of skin appendage signaling networks are conserved and anciently evolved.” (Discussion section). Text has been added to more thoroughly introduce the sp7 transcription factor and the sp7:EGFP transgenic line. 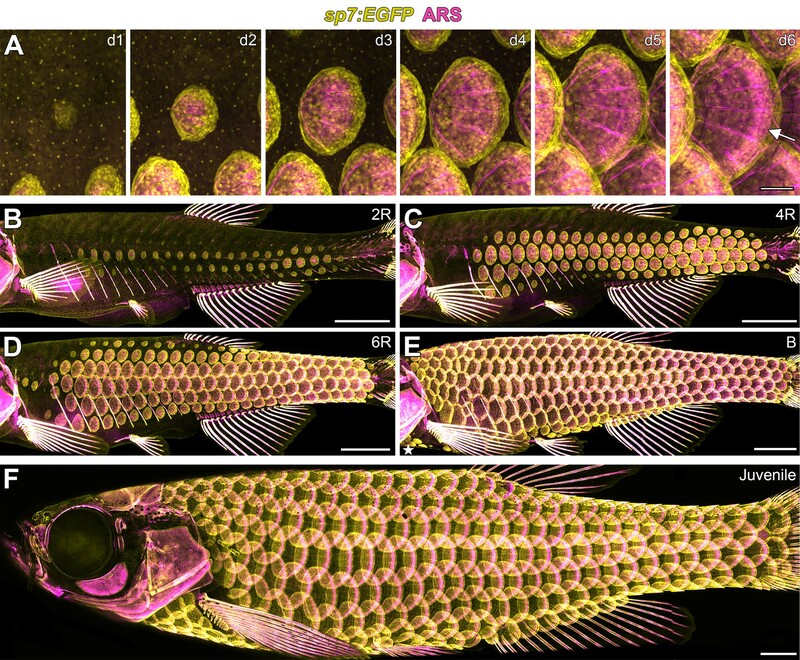 (subsection “sp7+ osteoblast-like cells generate scales and reveal amniote-like skin patterning in zebrafish”). For example, the word unprecedented in this sentence: "Our analysis, based on live imaging of individual fish, has revealed the developmental anatomy of squamation and individual scale development with unprecedented resolution." “Our analysis, based on live imaging of individual fish, has revealed the developmental anatomy of squamation and individual scale development.” (Discussion section). We removed our interpretation of why scales have not received more attention. (Introduction). This is possible, but filopodial extensions on leading edge cells suggest migratory behavior. Nevertheless, we have modified this section to more precisely describe the result without invoking migration per se. (Results section). Funded by NIH R35 GM122471 and University of Washington Royalty Research Fund #A112414 to DMP. We thank S Halabiya for assistance with molecular biology, T Piotrowski, R Dorsky, R Karlstrom, T Becker and M Harris for reagents, and Parichy Lab members for animal care. Animal experimentation: This study was performed in strict accordance with the recommendations in the Guide for the Care and Use of Laboratory Animals of the National Institutes of Health. All of the animals were handled according to approved Animal Care and Use Committee (ACUC) protocols (#4170) of the University of Virginia. All imaging and regeneration experiments were performed under MS222 anesthesi, and every effort was made to minimize suffering.